Anyways I have lots more to worry about right now like getting Christmas gifts in order and our family letter written (something new this year for us). Next week I think I will try my hand at doing our family Christmas pictures and hope that they turn out well because I'm betting it'll be to late to get an appointment with Target (whom we've used the last 2 years and really like). I enjoy trying new things and this will certainly be a test for me, for I am not a photographer but have always enjoyed playing around with the abstract so we'll see how it goes. As for the album I just wanted to give you an idea of where I am starting. What you see here is all the pages (1-25) that I have already put together a few weeks back. They are very plain because I didn't know how I was going to approach this album then and didn't want to limit myself. I already have a size limit, which is 6x6, so I didn't want to add to that. 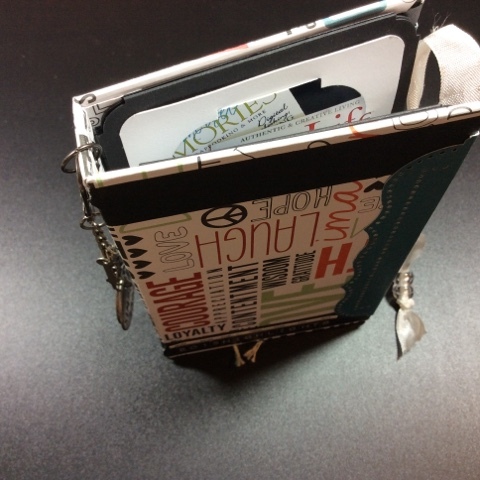 Now that I have done so thinking I think I will try an idea I picked up on Ali Edwards site today that she actually found through Tim Holtz. Last year Tim did the 12 Tags of Christmas and will be doing it again this year and so I think I might try this. I think I might aim for 25 tags though and use them throughout my album. We shall see how well this works, being that my time is limited. Of course this year I am only doing a few handmade gifts so that will certainly help, unlike in years past. I do have a vision of what I'd like for this album to look like when I am done and I hope that I can keep that in my head throughout the month. Ultimately though the real worth will be whether or not I can keep an accurate record and reflection of our life and times right now, that is really what is important so I will trust my intuition and just go for it. As you can hopefully see I have a variety of pages; some are transparent, a few are vellum, a couple of double sided pattern papers, a couple solid color cardstock pages, and finally a couple of CD envelopes that I have dubbed as pages with really cool pockets for hiding journaling or extra photos. The plan is to also add lots of texture as I am creating it maybe with bits and pieces of fabric and layers of this & that. Just not sure until I sit down to do it.